Recently I have had an awakening. That Meimei is no longer that small a baby, and I really should get my a** back to doing MORE with the boys. Drew up a new schedule and the first step is to start (resume?) a daily morning reading session. This morning I didn’t really have a clear idea what I wanted to do during the reading session. Read which books? Just read? Do I choose the books or let them choose? Never mind, just try first. Decided to start off with 弟子规。I plan to go through the whole book, one page at a time, and explain the teachings thoroughly to the boys. 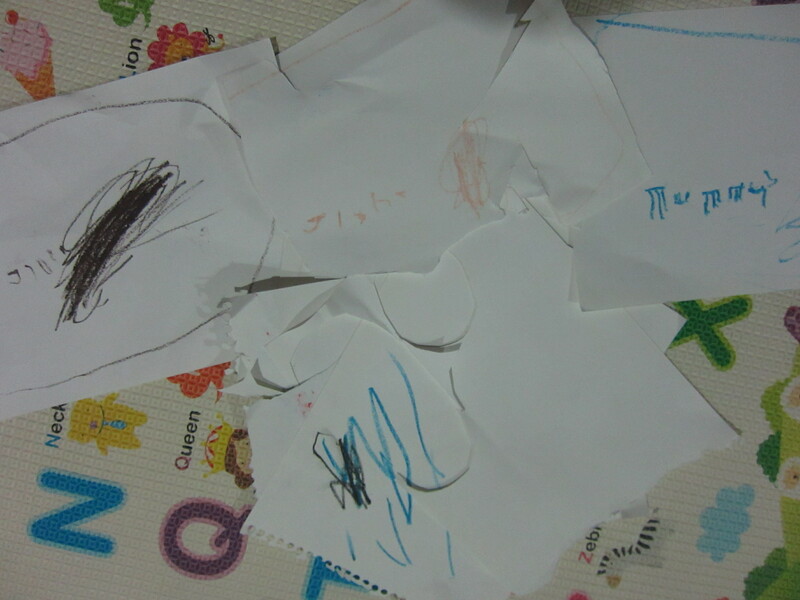 While explaining “信” (be trustworthy), I told the boys that they should keep their word, for example, if they promise to keep their toys after playing, they have to do it. (Haha.) So they started asking, what if we don’t? I replied that I would then give their toys away, and that there were many less fortunate children who did not have any toys. Ah-ha moment. I got out our book Material World, and showed them photos of families in other countries. That in turn led to a geography lesson with the globe (Ethopia vs South Africa). Good chance to teach the boys some Singapore history – that our country didn’t use to be as prosperous as it is now. Out came the Social Studies textbook. I recently attended a short workshop conducted by Eeva Chang, the principal of Eduplus Language Centre (among the many other hats she wears). It was a free workshop which anyone could attend, so it’s not considered sponsored, right? And nobody cared that I was a blogger lor. 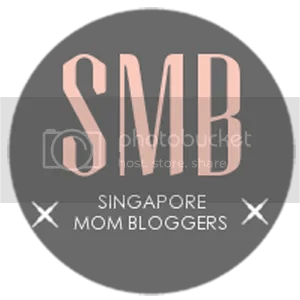 Frankly speaking, when I realised she was the principal of a private tuition centre at the start of the workshop, I felt quite sian and thought it would be like an advertisement and that it would be a waste of my time. 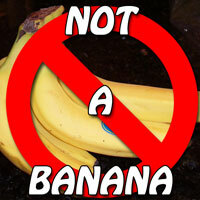 But I was pleasantly surprised to learn otherwise. I even took notes when I felt what she was saying made sense, and good things must share! 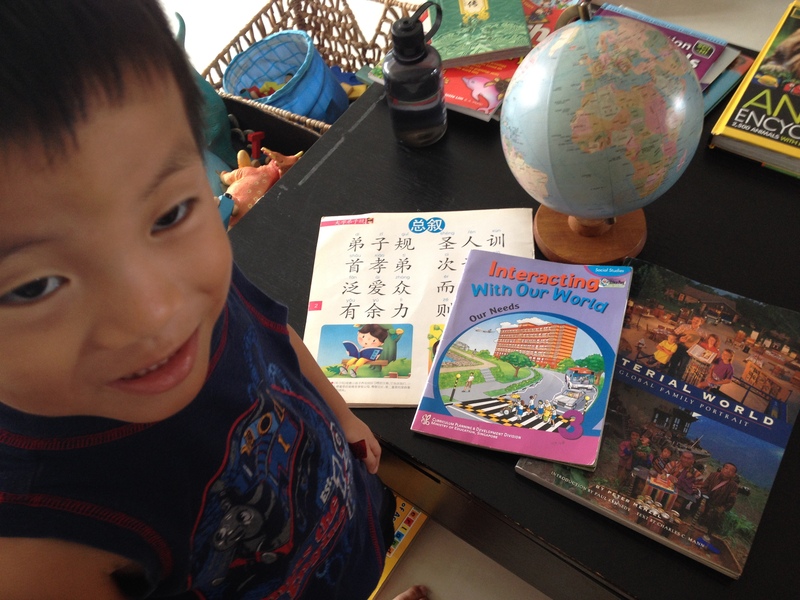 The main gist of the workshop is on three factors which affect a child’s grasp of the Chinese language. According to Eeva, the child’s grades start to fall as the discrepancy between the standard of the language spoken at home and the standard in the syllabus widens. Typically, this happens in Primary 3 as the syllabus in Primary 1 and 2 is still relatively simple and sounds like the casual Mandarin spoken at home. Thus, for the child to be able to catch up with the school requirements, the home environment has to provide progressively higher standards of the language. My thoughts: As I listened to the speaker’s examples of different standards, I knew that while I have no problems understanding up to Primary 6 standards (she didn’t go beyond that), I only spoke perhaps Primary 3 standard or lower to my kids. Isn’t it such a waste when I have the ability to ‘teach’ my kids but I am not doing it?? After pondering on it for some time, I concluded in my case, it’s not so much a worry that it would be too difficult for the kids to understand… but that I am too lazy to speak properly to them! Cannot, cannot. I must stop being lazy! The sequence of learning Chinese is from Listen >> Speak >> Recognise >> Read >> Write >> Use. The more the child listens to the spoken language, the more he will be able to speak with ease. As he speaks more in the language, it will be easier for him to recognise the words he sees. Eeva gave the example of 举一反三 — when the child knows this idiom, he will be able to recognise it just with the words x一x三. Then reading is about recognition anyway. And once the child can listen, speak, recognise and read, he won’t feel tired writing and using it. This is in contrast to what many parents and teachers make students do – copying words many times in an attempt to memorise them. Eeva told us that the image in the child’s brain when he hears the word is his understanding of the word. Thus she often asks her students to draw a picture based on a word she gives. From the picture, she can then assess their language abiilty. She did a simple exercise with us at the workshop – we had to do an action based on the word ‘flower’. Many of us used our hands to do something like a cupping action. Eeva demonstrated that there were many other ways to do ‘flower’, e.g. taking a deep breath to show the flower’s fragrance, or pointing to herself to indicate she was pretty like a flower. The more varied the child’s visualisation of a word, the more he will be able to describe things or emotions etc and write well. The above points are what I remember from the workshop and my translation based on my understanding. I was intrigued by Eeva’s sharing and had almost decided to attend her talk in September, despite the hefty ticket price. I think it will be an useful session, but it’s in the afternoon so childcare will be a problem. So it’s no go for me. But do click on the link to find out more about her talk if you are interested. Meanwhile, I shall start reading books on teaching languages, especially Chinese. No idea where to start, shall visit a Chinese bookstore soon for recommendations. If you know of any good books on this topic, please share with me! If it’s good, I will do a review and summary here after reading. Thanks in advance! When Kor Kor was very young, I had thought I would be sending him to preschool like most kids. I had even decided on the school. A few months before Didi was born, my mummy friends whose second child was also due around the same time enrolled their firstborns in schools. But it was then that I first felt the reluctance. Mine, not Kor Kor’s. He was about 1.5 years old then, and I didn’t want him to be away from me for so many hours everyday. I felt that I might be able to manage taking care of two young children on my own. As he grew older and as I read more, I became more certain that I wanted to homeschool him. This sounds crazy, right? We are all living in the same flat, Kor Kor and DIdi are sharing a bedroom with their beds right next to each other, and that’s still not enough time together? Hmm, one of the common reasons for sending the child is for socialization and to learn social skills. I think the kids need to spend more time to learn how to socialize with one another first! This is the reason why I have three kids close in age – so that they have playmates (socialization) and learn how not to kill one another despite being together ALL the time. If the kids are going to school, I would have to plan their naptimes and activities around schoolhours. And waste time traveling to and from the school. As it is, I am already having a hard time juggling three kids’ naptimes, especially since their KO time keeps changing as they grow. By homeschooling, there is no need to wake them up in the morning – they can sleep till they wake naturally. We can customize our schedule, e.g. if we have had a busy weekend, we can rest on Monday. When there is an interesting exhibition in town, we can go on a weekday and avoid the crowd. One of my guiding principles for choosing activities and books for the children is that it should preferably be something they do not get to do in school. I mean, if they are going to do it when they go to primary school anyway, why do it now? That’s double ‘work’! Ahem, fact is.. I am probably more highly educated than preschool teachers. And I have the great advantage of being the mother, and mother knows her child best, ya? I am confident I can teach my children at least as well as preschool teachers, though it is not likely that any parent can teach her child everything. And it’s ok, my children can learn as they grow, there is no need for them to learn everything right now. More importantly, it’s not just about academics, or even things like independence or social skills (important as they are). I don’t see myself as a control freak, but I would sure like to know and to control what my children are learning and whom they learn from. I think I would absolutely hate it if they came home with a bad habit and I couldn’t trace where they picked it up! This is not such a good reason… because it stems from fear.. and it’s never a good reason to do something because of fear… I believe that all children have a natural love for learning, and I am scared that premature formal schooling would drown this love. It’s not that children should not be stressed, but I believe it makes a difference whether the child is ready. For example, if Kor Kor were in kindergarten now, he would have to write. From what I observe as a result of him never being made to write, he CAN’T write yet. I am not sure how well he would be able to write if he had no choice but to do so, though I have no doubt he would definitely be able to do so under pressure from teachers and peers. Yet, it is developmentally appropriate for him to only write around seven years old, so why force him? Given that I do not want to do academic stuff with my kids at the preschool age, if they do go to kindergarten, I would not go through their homework or spelling with them. (And please, no chance of me doing their projects for them!) 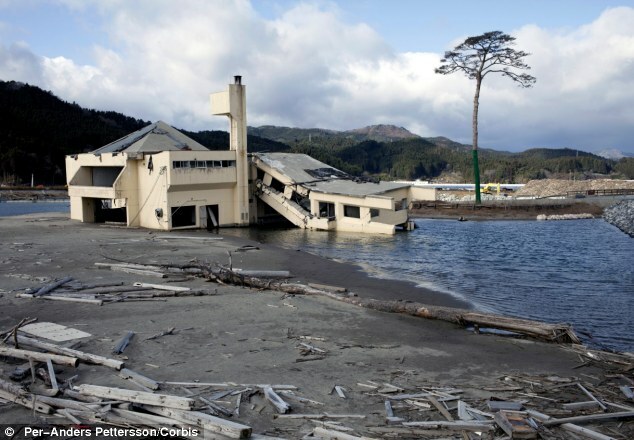 But… what happens when they do badly on the tests? What if the teacher labels my child as learning-disabled or lazy? What if the classmates laugh at him for his low scores? How will his self-confidence suffer??? A caterpillar cannot fly, and if it is told that it will never be able to fly, it might not even try to fly when it becomes a butterfly. I don’t wanna hothouse my seedlings. I wanna greenhouse them until they grow into tall, strong trees. A small seedling cannot survive the heavy rains and strong winds out there, but the tree can. One fine day, Kor Kor suddenly wrote his name, and Didi’s name, then ‘Mummy’. I know of many 4.5-year-olds who can already write way better by now, but what Kor Kor did was totally unguided (we have never taught him or asked him to write) and he did it when he was ready. I have faith that when he is ready, he will write more and write more legibly. A couple of months ago, Hubby and I observed that the boys, especially Didi, seemed to be really Cannot Make It in English. As in, totally catch no ball when someone speaks to them in English, and incapable of replying in English. I wasn’t worried, but to reassure Hubby, we started conversing with the boys a bit more in English. We could see the results very quickly – within two weeks, both boys were at ease speaking and understanding English. There was no resistance to the language at all. Of course, it’s not like it was a completely new language to them – we have always been watching English DVDs and reading English books together. Actually, I have never encountered anyone who is proficient in Chinese and weak in English, only the other way round. Whether it was my classmates from long ago or other kids nowadays, if they are good in Chinese, they are always good in English too. Conversely, if they usually only speak English, they are often struggling with Chinese, and might even be unhappy and unwilling when their parents try to expose them to more Chinese. True? Basically, it’s similar to how Kor Kor learnt addition. About half a year ago, I put up two clocks. Because we never had any big clocks before that! We looked at our handphones when we wanted to know the time, but I thought, how on earth would the kids learn to tell time without any clocks?? I put one of the clocks at the kids’ eye level so that it would be accessible to them. As usual, I brought the kids’ attention to the new additions once, briefly explained the purpose of the clocks, and left it at that. 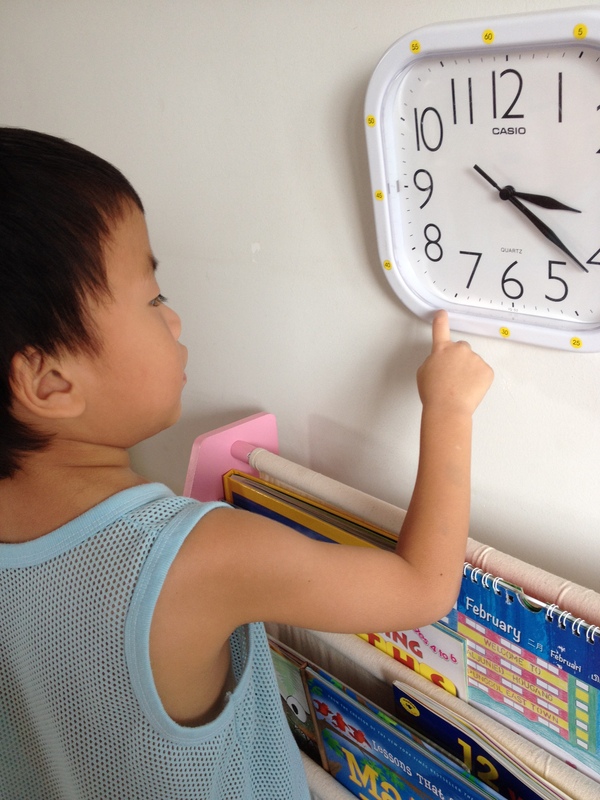 Shortly after, Kor Kor started to ‘tell time’ by saying it’s 九点一个字 or 四点七个字, referring to the respective positions of the hour and minute hands. It wasn’t the ‘official’ way, but it was effective – we understood what he meant. Recently, he started to take interest in the ‘minute’ markings on the clock, counting from 1 to 60 as he pointed at each marking. Wow of course that got me very excited as I saw a Golden Opportunity right in front of me again. I started to tell him the time in the correct format, e.g. 九点零五分 and 四点三十五分. And very quickly, he picked it up! But he’s still not 100% accurate lah. Mainly because he sometimes can’t make out whether it’s already, say 5 o’clock when the hour hand is between 4 and 5. 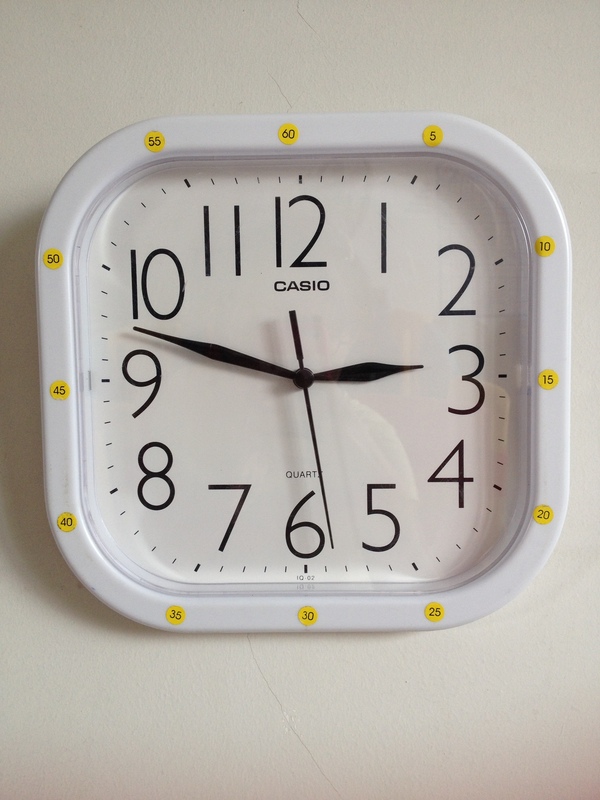 I pasted the number stickers myself cos I couldn’t find a suitable clock with ready numbers for the minutes. 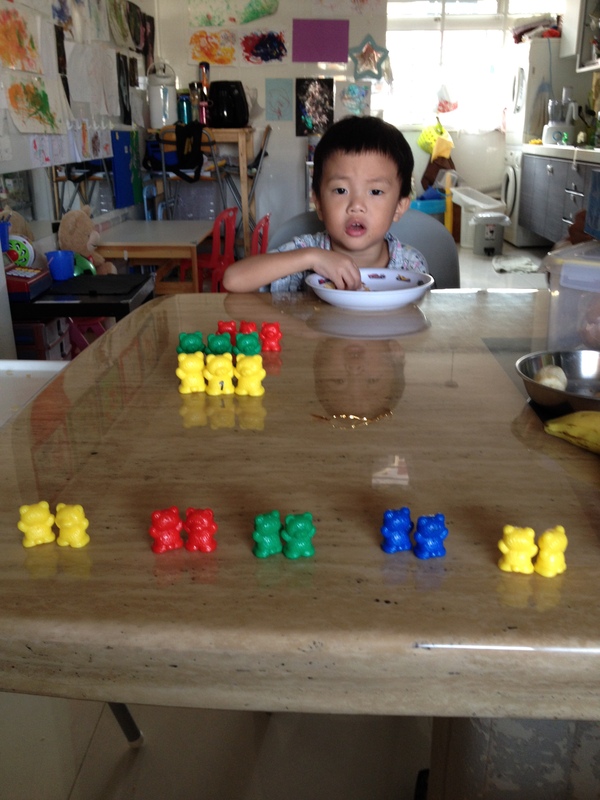 Learning Without Teaching: Addition & More! I have no idea what got into him suddenly! After we told him the answers, he would check his addition book, which only gave the answers without any pictures. Sometimes he could also tell us the answers himself, but I suspect it’s probably from memory rather than understanding. I have no illusions that he’s doing mental sums! But children need to understand concrete before abstract! 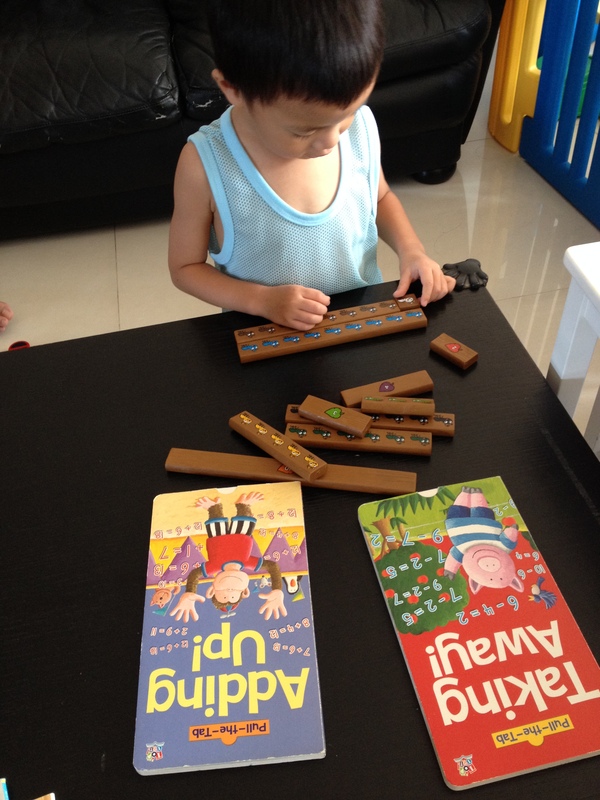 Thus I introduced him to a set of Cuisenaire rods for early learners. Pretty soon, he was using it for all his addition questions. The opportunity to introduce him to multiplication arose naturally when he started to ask ‘three plus three plus three equal what?’ (He was actually eating loveletters (kuih kapit, not the paper) and he asked for three each time.) At the third top-up of loveletters, I took out the bear counters and arranged them in three sets of three. Told him this was ‘three times three equals nine’. Didn’t explain further. I believe that by gently introducing him to new concepts over a long period of time (hey, we have more than six years from birth before he starts primary school! And hopefully a couple more years before he is tested on multiplication), he will be able to pick it up at his own pace. When he can understand, he will remember what I have been telling him and what he has been seeing (sets of bears!). Oh ya, we are also well on our way for division.